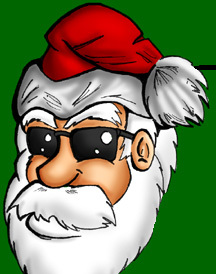 Welcome to the Web Comic Secret Santa site! Here, you can find out more information about doing the Secret Santa, who has signed up so far, and how YOU can sign up! December 3rd - Final date for submission. Comics will be distributed on this day. December 20th - The first day you can reveal yourself! December 27th - Sic'ing of the mad safety net dawgs if we haven't heard from you. * * * Please read the rules if you haven't already. You are responsible for knowing the rules. * * * Please check the 2005 deadbeat list to make sure you're not on it. If you are, and you shouldn't be, drop me a line. We'll fix you up.